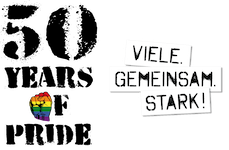 The logo of 2019 Cologne Pride motto can be used freely for the purpose of taking part in Cologne Pride as well as being in the parade. The size of the logo may be changed. The proportions must not be changed.